The vitreous is the gel-like substance that fills the back of the eye. 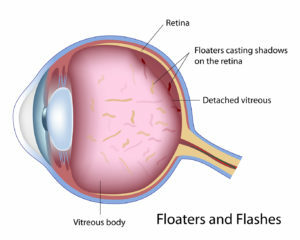 When cells or material clump in the vitreous, you may notice grayish spots in front of your vision called floaters. Some people describe seeing shapes of “bugs,” cobwebs, circles or squiggly lines. They are often more noticeable against a bright or white background. Flashes occur when the vitreous gel pulls on the retina, the thin layer in the back of the eye responsible for receiving images. This pull on the retina stimulates it and leads to lights or lightning streaks in the vision. Occasionally, a retinal tear or even retinal detachment can occur in these instances, and must be treated urgently.